Sitting under the bright lights on the set of WATE 6 News’ Living East Tennessee, Jordan Haney and Parker Chiles watch as the cameraman mouths “three, two, one.” The segment goes live and together the teacher and student let their memories fall back nine years. The year 2010 proved to be an exciting time for advancements in technology as it occurred during an economic uptick following the Great Recession, which slowed economic development for more than two years. 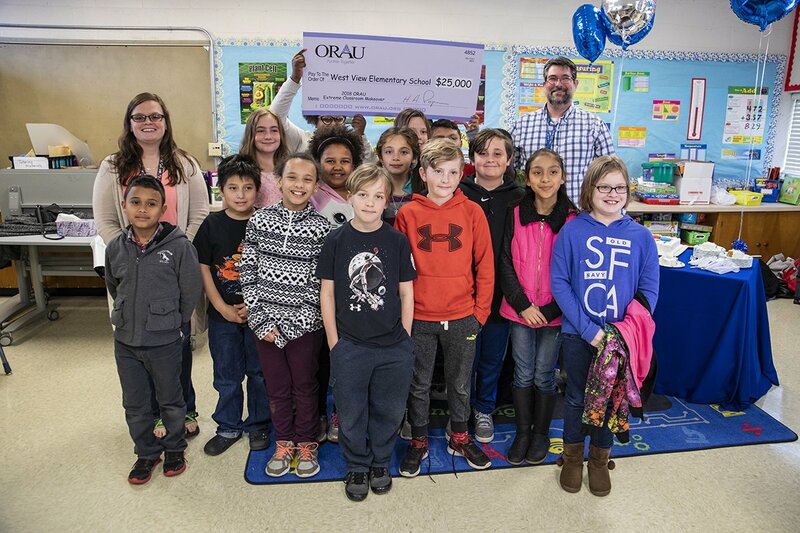 During this time of revitalization, Apple released the iPad, Time Magazine announced Facebook founder Mark Zuckerberg as Person of the Year, and Rocky Hill Elementary School teacher Jordan Haney won $25,000 in state-of-the-art technology for his classroom through ORAU’s Extreme Classroom Makeover. Almost a decade later, technology has evolved, but the technology Jordan Haney received in 2010 has continued to impact the classroom experiences and education of his students. ORAU launched Extreme Classroom Makeover in 2009 to highlight and support educators who use technology to inspire more students to pursue math- and science-based careers. With this grant, Haney purchased iPads, MacBooks, iMacs and a Wii. He immediately started implementing video creation into lesson plans and improved communications with his ePal program, an email pen pal program with an elementary class in France. Chiles, who was among the first of Haney’s students to use the new technology, still remembers the innovative projects that allowed him to expand his imagination and basic technology skills. Now in his first year of college, Chiles’ eyes still light up when describing his fifth grade experience. “We did one video that was stop-motion with every student in the fifth grade, and it was amazing. I had never been in a class with this type of technology before,” he said. When asked if he remembered what his favorite subject in school was, Chiles responded “lunchtime” in shy jest; but Haney quickly refuted and argued that Chiles was a “rock star” in math. In fact, Chiles never minded spending extra time in Haney’s classroom immersed in the new technology to explore. And he carried these early STEM lessons with him beyond Haney’s classroom long after his time at Rocky Hill. Haney’s experience seeing his students grow in their educational pursuits with the help of this technology has been more rewarding than the initial $25,000 grant. Now in the tenth year of Extreme Classroom Makeover, ORAU has invested more than $372,000 in technology for area schools, for their teachers and for the students like Parker Chiles whose eyes still light up at the thought of learning STEM. To apply for this year's competition, visit the Extreme Classroom Makeover application page. Submit a 3-4 minute video creatively illustrating the need and potential uses of technology in their classroom. Want to learn more about Exteme Classroom Makeover? Contact Jenna Harpenau at 865.574.8669 or extreme.classroom@orau.org.